I can still remember when I first saw the mudflats along the Shubinacadie canal when I moved back to Nova Scotia in 1998. The gorgeous red colour of the mud was so inviting and I saw that same mud along the Minas basin and throughout the Annapolis Valley. When I was in school in 2005 and first saw what we call Lantz clay, I could see that it was the same stuff that was along the rivers and knew it was what I would continue to use in my clay practice. 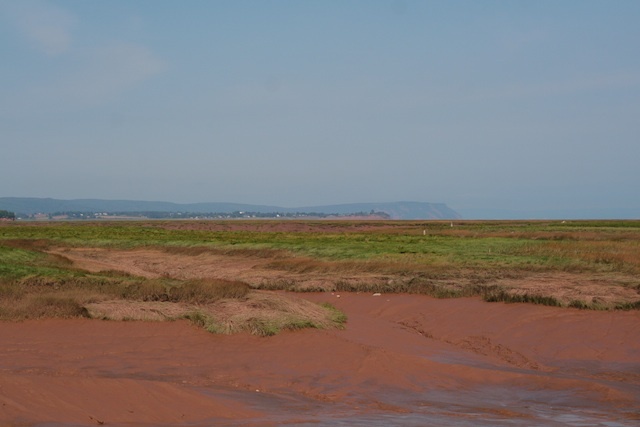 Mud flats at Blomidon, Nova Scotia. This winter I ordered 2000lbs of clay, in 50lb bags and in order to use it for throwing I need to process it. I add Kyanite to it which helps to make the end product more resistant to thermal shock. So when you pour boiling water into a mug it doesn't crack. This is my lovely pug mill. It is a Venco Supertwin and I got it used from someone in Quebec. It is easy to use, surprisingly quiet and is a workhorse. I cut up the clay into smaller pieces and this is a small bucket of the Kyanite that I am slowly adding in. The clay comes out in these 4" diameter logs that I can cut to whatever length I like. For the first run through, it is the Nova Scotia clay mixed in with the Kyanite. The vaccuum is not attached so it comes out a bit rough. I then put this clay back into the pugmill along with my reclaim clay. In the process of making there is lots of bits left over, trimming scraps, thrown pots that don't work out, scraps from throwing, and even the muddy throwing water gets dried out. I take these scraps and dry them out completely, rehydrate them with water and then dry it out a bit to get to the right consistancy. This ensures that I have no wasted clay, everything gets used and reused to reduce waste to next to nothing. PJ is taking her supervisory duties very serious. This is the finished pug. I attach the vaccuum to the pugmill and it takes out most of the air from the clay and makes the clay nice and tight, aligns the particles and gets it ready for use. The nice smooth finish is evidence of this. I cut the logs into about 6" lengths which is the equivelant to about 6lbs. I was able to get the 2000lbs of Lantz clay, mixed with 200lbs of Kyanite and about 500lbs of reclaim clay done in about 3 days - all wrapped tightly and stored in my cupboard ready to use. I'm not sure how long it will take me to go through but the work is worth it so I can use this beautiful Nova Scotia clay for my pottery.